Forty-five years ago today, Luis Monge was gassed in Colorado for murder — the last execution in the United States before a decade-long lull in capital punishment in the U.S.
Monge, an insurance salesman with no prior history of violence, had a hearty brood of 10 children, but when his wife found out he was having an incestuous relationship with one of them, Monge bludgeoned the wife to death, and killed three of the young children just for good measure. Monge pleaded insanity, and then when doctors found him sane enough to stand trial, just pleaded guilty — eventually dropping all appeals and asking to be hanged in public at the Denver City and County Building. Even though Monge himself embraced execution willingly, his seven remaining children (also the children of, and siblings of, his victims: surely a difficult position) still fought for clemency, and shared Monge’s last meal with him. Had Monge maintained his appeals, he — like four other Colorado inmates whose death dates were also on hold in 1966 — would likely have made it into the nationwide unofficial moratorium on executions that settled in while courts sorted out death penalty standards in the late 1960s and early-to-mid 1970s. * That period led into 1972’s landmark Supreme Court decision Furman v. Georgia, invalidating all existing death sentences in the country and sparing men much more nefarious than Luis Monge. Instead, this date’s principal went to his death clutching a black rosary (and allegedly, and one must suspect apocryphally, asking if the gas would trouble his asthma)** and became a nigh-forgotten denouement from a closed chapter of death penalty jurisprudence, and the last man put to death in America until Gary Gilmore almost ten years later. Apart from his milestone status vis-a-vis capital punishment nationwide, Monge is also the last person to die in the Colorado gas chamber. The gas chamber that killed Luis Monge, now retired to Colorado’s Museum of Prisons. (cc) image from Cowtools, who also has a photo of Monge’s bullet-riddled grave marker. In fact, Monge is currently still the second-last put to death in Colorado, period. 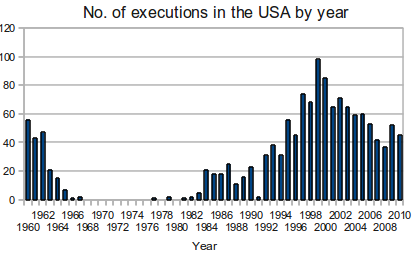 It would be fully 30 years before Colorado executed again — in 1997, by lethal injection. As of this writing, it hasn’t done so again since. 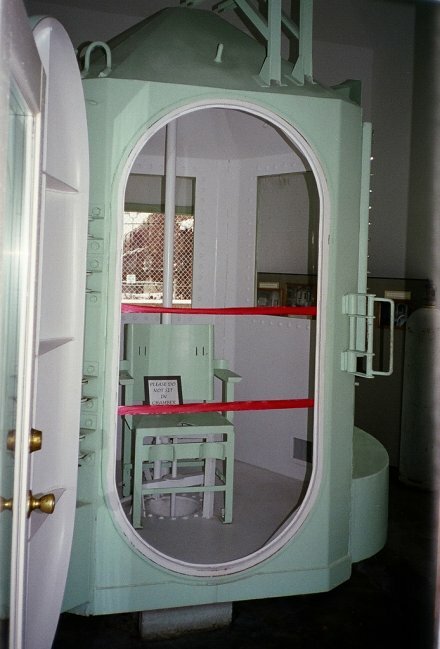 * If Monge had avoided execution, the “last pre-Furman execution” milestone would be held instead by California’s Aaron Mitchell, the only man executed on the authority of California governor (and future U.S. president) Ronald Reagan. Went to school…Good Shepard for girls, denver…with Diane, his daughter. Worked with her in the kitchen…one of the most beautiful yet saddest people I’ve ever known. We treated her gingerly, as the whole incident of gas chamber and news coverage was going on.